QNAP has launched the new 10GbE-ready TS-x63XU rack-mountable NAS. 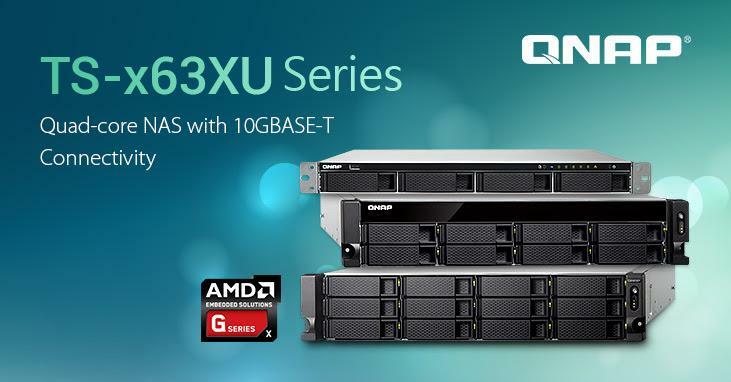 “Besides performance and scale-up architecture, the 10GbE-ready TS-x63XU NAS series is packed with abundant business applications and reliable system operations to fully back business needs in data storage, disaster recovery, and virtualisation,” said Jason Hsu, Product Manager of QNAP. Pre-installed with a single-port 10GbE 10GBASE-T network card, the TS-x63XU series delivers up to 1,038 MB/s read speed and 985 MB/s write with AES-NI encryption acceleration. Supporting SSD caching, tiered storage allocation, and excellent expandability with a QNAP 12-bay expansion enclosure, QNAP say the TS-x63XU series is ideal for business organisations looking for a secure private cloud and efficient IT infrastructure for 10GbE networks. The TS-x63XU supports VMware, Citrix, Microsoft Hyper-V and Windows Server 2016, and can also natively host virtual machines and LXC and Docker containers. Snapshot support is also provided to help users quickly restore the NAS to a previously-recorded state, providing an ideal solution for mitigating the effects of unexpected NAS failure or ransomware attack. The storage capacity of the TS-x63XU series can be expanded on demand by attaching a QNAP expansion enclosure. QNAP's VJBOD solution also allows users to expand the capacity of TS-x63XU models by using the unused storage capacity of other QNAP NAS. It also supports apps downloaded from the QTS App Centre.